Thanks for stopping by to check out this week's SHOPPING OUR STASH challenge. This week the SOS crew are all Bent Out of Shape and we want you to join us! I am not well skilled at making shaped cards. I have a few dies that will cut shapes that I could use, but of course I loaned out my cuttlebug...soooooooo I had to find something else. 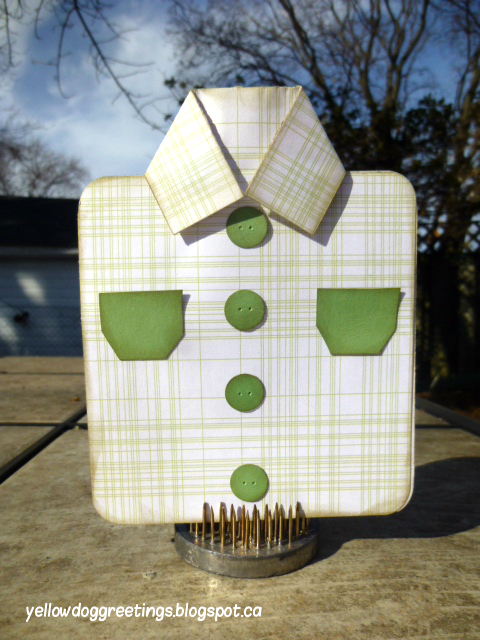 I found this dress shirt template / tutorial and decided to give it a try. Always a good thing to add to your stash of masculine cards right?? Check out the SHOPPING OUR STASH BLOG for all the details on the cahllenge. While you are there, please share some love with the rest of the crew. Oh great choice, I never thought about that one; awesome job on it. Nice to have a challenge that gets us out of our "rectangle" lol. super-duper-duuuuuuuuuuuuuuper cuuuuuuuuuuuuuute! seriously awesome shaped card with BONUS POINTS for also being a brilliant guy card too! double header!!! You lent your Cuttlebug? You are a better friend than I think I could be. No die cutting ability? Ack! Nicely done without it! The paper is perfect for a guy shirt. I really like the way this "shaped up!" Okay, forgive the bad pun! Neat card and, as Lauren observed, a really super idea for a man card! Wonderfully done! This is a darling shirt! You could change up the paper used on it for all sorts of occasions. Very clever!